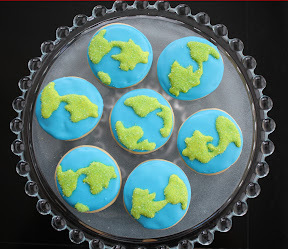 just-iced cookies: Earth Day Giveaway!! Earth Day is March 20, 2010!!! In commemoration of the 40th Anniversary of Earth Day, I'm doing my first GIVEAWAY!! 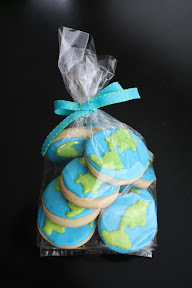 Up for grabs is one dozen, 2" in diameter Planet Earth freshly baked, hand-decorated sugar cookies, wrapped in an FDA approved cellophane gift bag and tied with a coordinating ribbon. Let me know in your post which of these you have completed (and any usernames associated with your accounts for verification). Contest ends at 8:00 p.m. EST on March 16, after which the winner will be announced. Winner must contact me within 48 hours, or it's going to the next contestant. Good luck!! Those are so awesome! I totally want some! And I'm now a fan and I posted it on my FB page! how did i not know you did this?!!! it took jen posting it on her blog for me to find out! my mouth is seriously watering. so glad to find you here!! i'm a fan on your facebook page now too!!! oh, and i linked to it on my facebook page too!! Kristen, these are so cute! Sugar cookies are my FAVORITE! I only have facebook, so I have become a fan and posted it on my FB. k- so I follow this blog, I'm a fan of your facebook, I follow you on twitter, I just tweeted (?) about it, and I just posted to my facebook! and I follow your tweets girl.. WHEW! Kristin, it's Mindy.....could those be any cuter?! I saw them on facebook. You are quite amazing!! YUMMO! I want to win! ALSO if your looking to generate some more traffic I am wondering if you and your business would be interested in sponsoring a review and possibly a giveaway on my blog, http://www.dangginagives.blogspot.com/? I have this blog to find fantastic products for me, my family & friends, and also to help out fellow entrepreneurs. My blog targets other mothers and wives who are searching for the best. Once a product is sent to me, I begin my review and enjoy providing an honest opinion on what features I love and sometimes, if applicable, where I feel a product may need some improvement. I have found that a review receives more traffic when it is accompanied with a giveaway. I always require, as the mandatory entry into a giveaway, that my readers view the sponsor's site and then tell me what their favorite product is. This guarantees my sponsor that their site is receiving traffic and that their products are being viewed. This also helps "Boost" Business for the sponsor! Gina was such a PLEASURE to work with! She communicated really well with me. Whenever I had questions, she would email me back immediately!! This was my first experience doing a "giveaway" and I wasn't sure what to expect. It turned out to be an EXCELLENT experience for me! I experienced a lot of activity during the week of the review and giveaway. I also received a large order as well! Thank you so much Gina for your wonderful personality and doing such a fantastic job! I look forward to all your new giveaways each week and I know I'll be back to GIVEAWAY more in the near future at DANG GINA GIVES blog!! I have just loved working with Gina and the Dang Gina site. She has been such a joy to converse with through email. She is so willing to give of her time and talents so that businesses all around can get the word out about their company and product, plus who doesn't love a good giveaway! I highly recommend donating services and or product for the Dang Gina giveaway blog. I have now used her for two of my businesses. If you would like any more information, please let me know. Thank you for your time and consideration. I look forward to hearing from you. I just became a fan on Facebook. This is so awesome! You are one talented lady - reminds me of your cute mom. Cute cookies kris! Super creative! Oooh, yum! I so want to win these! I want them! You have many amazing talents--no fair! I am a fan on your facebook and I posted the giveaway on my facebook (truthfully, I don't want anyone else to know about it because I really, really want it!). Let's make some samples in April!!! You are the cutest...I'm just dang proud!!! What beautiful cookies, you are so talented!!! I just became a fan on Facebook. My name is Tammy Pack, and I too love to decorate cookies - but mine NEVER look this cute. I would love to be the winner of the Earth Day giveaway! Thanks for sharing your talent with all of us! Me, me! I want to win! This almost makes me want to get on facebook for the extra entry possibilities. They look so good. Once again, I am amazed at your talent. Awesome cookies, you are obviously super talented. Just added myself as a follower, can't wait to see what other stuff you come up with!